A vegetarian soup made with seasonal ingredients. Parsnips are available from the UK in the winter months. Heat half of the oil in a large pan. Add the onion and one garlic and fry on a medium heat for around 1 minute. Add the parsnips and fry for another 2 minutes. Add the bouillon and cook the parsnip for around 10 minutes until it is soft. In the meantime hard boil the eggs, leave to cool and peel and quarter. Heat the rest of the oil in a different pan and fry the mushrooms for around 4 minutes. Add the other crushed garlic and fry for 1 more minute. Mix together the dried dill and the creme fraiche and season with freshly ground pepper. 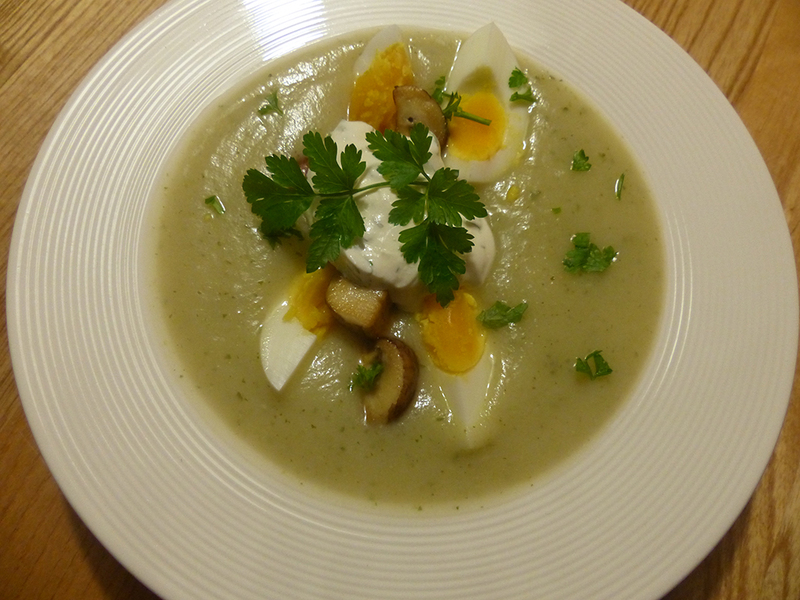 Ladle the soup in bowls, decorate with the eggs, mushrooms and creme fraiche.